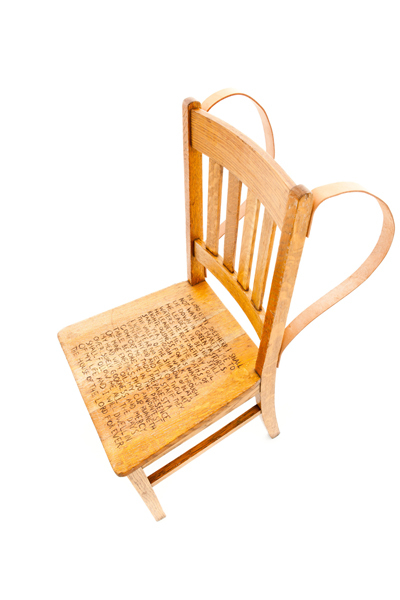 This object, complete with leather straps—and the 23rd Psalm engraved on the seat of an old classroom chair made of oak—is intended to be ‘wandered’ or carried on one’s back, much like a backpack. To perform it, I have fitted it on my own back, and carried it through the forest. As I’m walking, whenever I’m ready, I put it down and sit on it, and when I see fit, I take it up again. The Psalm reads “The Lord is my shepherd, I shall not want…he maketh me to lie down in green pastures…” and, not surprisingly, I feel the work as a whole resonates best when activated in a pastoral setting, far away from human presence. Breeze, sunlight; and the individual/wearer ‘sitting’ with a sense of intention and comfort.